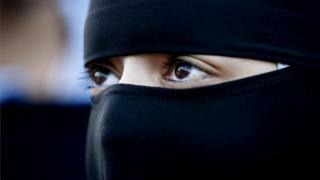 A Muslim organisation in Norway has been criticised for hiring a communications officer who wears a full-face veil, or niqab. The culture minister, Muslim MPs and other Muslim organisations have condemned the Islamic Council of Norway's move. It comes after the government gave the group 484,000 kroner ($55,000; £44,000) to improve interfaith dialogue. Norway's parliament has already supported banning the niqab in schools. A vote on the issue in last year had cross-party support and the ban is likely to be enforced later this year. Several European countries have banned the niqab in public places. The Islamic Council of Norway IRN, which says it aims to promote unity between Muslims and non-Muslims, appointed 32-year-old Leyla Hasic as its spokeswoman over the weekend. IRN General Secretary Mehtab Afsar told Norwegian TV Ms Hasic had been chosen because she was best-qualified. "I find it amazing that the same people who are so concerned about freedom of expression act this way when a woman in a niqab comes out and participates in working life," he said. But Culture Minister Linda Helleland said in a Facebook post that the move was "ill-advised" and would "create distance and less understanding". Muslim MP Abid Raja told state broadcaster NRK Ms Hasic's appointment was "not a good day for Muslims". "This is unwise and undermines the confidence Muslims need to build in relation to Norwegian society," he said. On Tuesday several Muslim groups issued a joint press release saying they lacked confidence in the IRN. Local media report that some mosques have indicated they will withdraw from the IRN over the controversy.